Soundbites are hour long lunch time concerts curated and performed by ANAM musicians. Throughout the year, these concerts feature diverse solo and chamber repertoire. For this Soundbite, the Partridge Quartet (Winners of the 2018 ANAM Chamber Music Competition) are delighted to perform two stunning string quartets by Beethoven and Bartók. They can’t wait to return to the South Melbourne Town Hall once more as they arrive from a week of intensive workshops and performances on the AYO Chamber Players program and Musica Viva Festival in Sydney. Prepare for an exciting and emotionally loaded afternoon of chamber music with Bartok’s fiery 4th String Quartet and Beethoven’s final ever masterpiece written for the string quartet. The Partridge Quartet is a Melbourne-based ensemble comprised of violinists William Huxtable, Mana Ohashi, violist Eunise Cheng and cellist Daniel Smith, established at the Australian National Academy of Music (ANAM) in 2016. 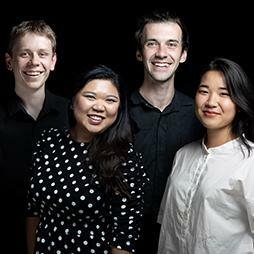 The quartet strives to contribute to the Australian music scene with vibrance and creativity and has recently received national recognition through its successes as recipients of the Musica Viva Chamber Music Prize (2017) and first prize in the prestigious ANAM Chamber Music Competition (2018). In 2018, they were selected as one of 10 string quartets world-wide for a 3-week string quartet residency program at the Banff Centre of Arts and Creativity in Canada. Locally they have performed at the Melbourne Recital Centre, hosted concerts at the National Gallery of Victoria and performed live on 3MBS and ABC Classic FM. For 2019, the Partridge Quartet has recently performed with leading Australian clarinettist Paul Dean at the 10th Anniversary Gala Concert at the Melbourne Recital Centre. They will be touring to Sydney in late April to perform at the Musica Viva Chamber Music Festival as part of the AYO Chamber Players Program. The Quartet has been involved in an exciting project of connecting Australian chamber music with audiences using motion capture technology. Through a collaboration with the Quartet, Deakin University’s motion.lab, Australian composer Paul Stanhope and ANAM, they hope to create a new visual representation of classical music performance through animation set to be released in 2019. As prize winners of the ANAM Chamber Competition 2018, they will be hosting a concert at the Melbourne Recital Centre Primrose Potter Salon later this year in October. William Huxtable (violin): William is in his fourth year at ANAM and currently studying under Robin Wilson. He also studied under Paul Wright at UWA where he received the Delano Music Scholarship. He is currently an emerging artist with the Australian Chamber Orchestra and has performed for concertmasters Noah-Bendix Balgley (Berlin Philharmonic) and Roman Simovic (LSO). Mana Ohashi (violin): Mana is a recent graduate of ANAM where she studied for three years under the tutelage of Robin Wilson. Recently, Mana was an Athenaeum Club prize winner for her performance of the Sibelius Violin Concerto in the ANAM Concerto Competition. She has had the opportunity of performing alongside musicians of the Mahler Chamber Orchestra in Germany last year and will perform with the Australian Chamber Orchestra as an emerging artist this year. Eunise Cheng (viola): Eunise is a recent graduate of the ANAM studying under Caroline Henbest and is a past scholarship and multiple prize recipient at both University of Melbourne and University of Western Australia. She has performed at major festivals in Australia including the Huntington Estate Music Festival, Perth International Arts Festival, Melbourne International Arts Festival, Musica Viva Festival, Four Winds Easter Music Festival. Her career highlights including performing alongside the Australian Chamber Orchestra, Australian String Quartet and Australian World Orchestra. Daniel Smith (cello): A graduate of the Queensland Conservatorium of Music and most recently, ANAM, Daniel has enjoyed both a plethora of musical experiences. He has been awarded the Peter Weiss Cello Scholarship (2012) and selected to perform alongside violinist Joshua Bell in the 2013 International AYO Tour. He has participated in masterclasses with Nicolas Alstaedt, Li-Wei Qin, Timo-Veikko Valve, Alban Gehardt and performed alongside the Australian Chamber Orchestra, Elision Ensemble, New Zealand String Quartet, Tinalley String Quartet. Daniel also performs regularly with the Queensland, Melbourne and Tasmanian Symphony Orchestras and Orchestra Victoria.